Enjoy the timeless earthware tones of our beautifully handcrafted Go Green ceramic bowl. Make your family dinner table something truly down-to-earth with our beautiful and warming Go Green Earthware ceramic dinner plate. Tired of poorly made, toxic imports? 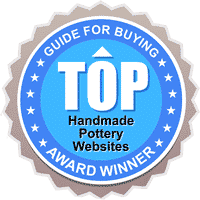 Shop Made in the USA and you'll be delighted with the dedication to quality apparent in every household article handcrafted by the master potters at Emerson Creek. Warm and inviting, our little coupe plate in our Go Green Earthware line is a fantastic piece to begin the presentation of a delicious homemade dinner. The rich, deep browns of this bowl make it perfect for mixing and matching with like patterns or contrasting styles from Emerson Creek. Use our handcrafted ceramic bowls to serve all of your favorite dishes – from hearty soups to delicious ice creams and other desserts. Our 7 3/4″ handmade ceramic bowls have a fine broad rim, and you’ll be amazed at how much they will hold. Whether it is a fine consomme or a hearty stew, you’ll find the rim of these handmade bowls holding it all in. All our ceramic dinnerware is handmade and handpainted at Emerson Creek. All pieces are microwave and dishwasher safe, ovenproof, and lead free.